Metalysis, a UK powder production company, has opened its first commercial plant in Wath upon Dearne, South Yorkshire, UK. Metalysis, a UK powder production company, has opened its first commercial plant in Wath upon Dearne, South Yorkshire, U.K. The project was mechanically completed in Q4 2017 and has since undergone hot commissioning, trial runs, optimisation and handover to operations. The handover shows Metalysis’ transition into commercial production following more than a decade of phased technology development. Metalysis uses a solid-state, modular, electrochemical process to produce metal alloy powder. On an industrial scale, the process could produce tens-to-hundreds of tonnes per annum of niche and master alloys, the company said. The alloys are suitable for industries such as aerospace, automotive, batteries, light-weighting, magnets, mining and 3D printing consumables. The technology has a multi-metal capability which enables the company to produce alloy ‘recipes’ that comparable processing routes reportedly cannot. Currently it can commercially produce a product mix of titanium alloys, master alloys including scandium-aluminide, complex alloys including high entropy alloys, magnet materials, high temperature materials and platinum group metal alloys. 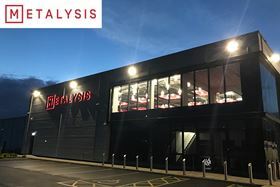 ‘In powering up and operating our industrial plant, Metalysis is poised to achieve its target to generate significant profits from our new South Yorkshire production facility,’ said Dr Dion Vaughan, CEO. This story is reprinted from material from Metalysis, with editorial changes made by Materials Today. The views expressed in this article do not necessarily represent those of Elsevier. UK metal powder producer Metalysis says that it has raised £12 million before starting commercial, industrial-scale production of its products. Metalysis Ltd reports that it has successfully produced graphene using the company’s proprietary electrochemical metal powder manufacturing process.